First of all "Happy Vinayaka chathurthi" to all my friends here. 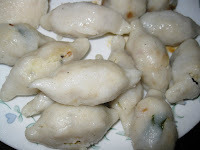 Well this year its special for me because I got some help from my twins in making Kozhakattais. They tried making those cups. Even though it didn't work out well for them, I am happy they took part in this process of making Neivedhyam and helped me arranging pooja items. 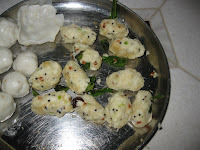 This year I made Vella kozhakattai and two kinds of Uppu kozhakattai and ammani kozhakattai. In my mom's place we make uppu kozhakattai using only Urad dhall. But in my in-laws place, we make uppu kozhakattai with all the three lentils i.e., urad dhall, channa dhall and toor dhall. I wanted to make both of them and I did it. 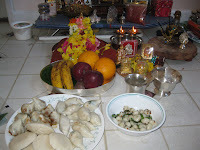 Since I have already posted the recipe for vella kozhakattai and uppu kozhakattai, I am just posting the recipe for only Ulundhu kozhakattai which we make in our mom's place, here along with my pooja pictures. Soak urad dhall for two to three hours along with green chillies to it. Then grind it after two hours, coarsely and steam cook it adding salt to it. When its cooked, scramble it and keep it aside. Now take a small pan, pre heat oil, splutter mustard seeds, fry urad dhall, red chillies, asafoetida powder and curry leaves to golden brown and add the scrambled urad dhall to it. Stir it for couple of minutes. Sprinkle water, if it is too dry. Turn off the stove and make it small balls when it is warm. 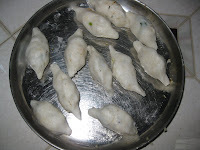 Now when you are ready to make kozhakattai, make small cups out of the dough, fill it with urad dhall balls and cover it according to the required shape. Stem cook it for 15 to 28 mts or till its fully cooked. 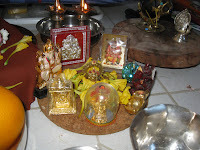 happy vinayagar chathurthi vidhya..nice pujas n clcikcs...thx for sharing...by the way frst time 2 ur blog..u have wonderful collections..will keep visitin! Good celebration vidya ! Wishes! Very divine pooja in your picture and neivedhyams are simply lovely. 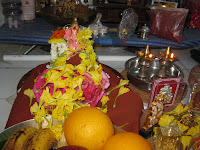 Thanx for visiting my blog,happy vinayaka chathurthy,and nice pooja pics..